HOME > Books > Japanese > Manga > Nichibei taiheiyou kessen!! The eight manga (comic) stories in Nichibei taiheiyou kessen!! (Japanese-American Final Battle in Pacific!!) 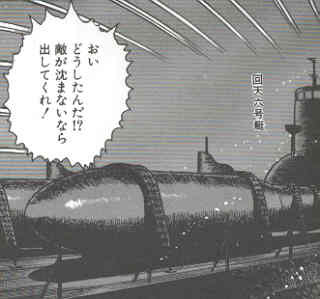 originally appeared in Konbatto Komikku (Combat Comics) in 1995, the 50-year anniversary of the end of World War II. These manga stories cover several historical incidents during the final year of the war. The first six stories present real history, although in a sketchy manner due to word limitations of a comic format with about 30 pages for each story. The last two stories provide an alternate history of what could have happened if the Allies had invaded the Japanese mainland. This book has two stories about special (suicide) attacks. "Fate's Wake," which depicts the sinking of the heavy cruiser USS Indianapolis by torpedoes launched from the Japanese submarine I-58, includes kaiten (manned torpedo) pilots as main characters. "Special Attack!! Battleship Yamato" presents the giant battleship's sinking by American warplanes. The manga plots closely adhere to historical facts and provide basic details about these two events. The book also contains two eight-page sections with historical background information, including several maps and a brief discussion of whether or not special attack corps members were subject to mind control. The six kaiten pilots in "Fate's Wake" all eagerly press the I-58 submarine commander, Mochitsura Hashimoto, to let them make an attack. However, the manga explains little about why they have such a fervent desire. The calm wisdom of Hashimoto contrasts sharply with the simplistic enthusiasm of the kaiten pilots. On July 28, 1945, two kaiten weapons are released, but they fail to hit the intended target. When the I-58 submarine spots an enemy warship on July 29, Hashimoto decides to launch six regular torpedoes at 11:26 p.m. despite two pilots ready to be launched in kaiten. When the I-58 rises to the surface about an hour later, Hashimoto concludes that the warship must have sunk since no ship can be located on the horizon. The warship turned out to be the U.S.S. Indianapolis, and only 316 of a total crew of 1,200 men survived after 107 hours of floating in shark-infested waters. The remaining kaiten pilots become angry with Hashimoto and question why he did not launch the kaiten, even though the regular torpedoes sank the ship. He explains that personally he does not think special attacks are appropriate, but he realizes that now there is no other way to protect Japan. He says that he certainly will launch the kaiten if they have a good target, and later before the end of the war he does launch them in attacks. This open dialogue between Hashimoto and the kaiten pilots almost certainly did not actually occur since superiors in the Japanese Navy would not tolerate aggressive questioning by subordinates. Although told by means of manga, the story "Special Attack!! Battleship Yamato" provides an accurate summary of the final mission of Japan's largest and most famous battleship. On April 7, 1945, American planes intercepted the Yamato en route to Okinawa, where the Japanese Navy had planned to use the ship's giant guns against the American fleet. The Navy designated the mission as a special attack, meaning that none of the crew expected to return from battle. The manga drawings depict the American planes attacking the battleship and the ship's guns firing. Despite the devastating attack, the Yamato's commander, officers, and crew remain composed as they await an honorable death. Only 266 survive of the Yamato's crew of slightly over 3,000 men. The eight manga stories in Nichibei taiheiyou kessen!! provide an informative historical summary of key events in the final months of the Pacific War. 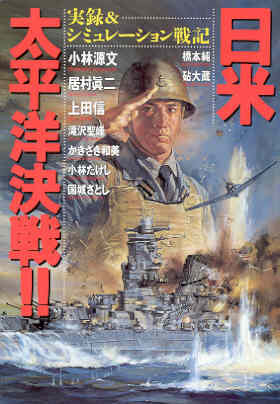 Although accurate in its presentation of facts, the stories that feature kaiten pilots and the battleship Yamato explain little of the motivations and feelings of the men who made these special attacks.